While building regulations have reduced most societal risk, individual risks have been gaining prominence, particularly in developed countries where the cost of slip and fall public liability claims is high. One question that is often asked is, have you caused loss and amenity to others by negligent action or omission that otherwise would not have occurred if reasonable care was taken? Whether or not we agree with slip resistance requirements, the community at large expects floors to be aesthetically pleasing and be adequately safe for its intended use. Although these may sometimes appear to be competing performance objectives, these can be overcome by using safe design principles. Safe design employs a risk management approach and evaluating safety in terms of the likelihood and consequence of an incident to occur. As well as providing slip resistive flooring other design features should be considered and include awnings, airlocks and matting to reduce the extent and likelihood of contamination, visual aids (warning signage and contrasting stair nosings), administrative controls (cleaning regimes and maintenance), fall prevention aids (barricades and handrails) and consideration the environmental conditions (lighting and sloping surfaces) along with the footwear to be worn. The various state based Occupational Health and Safety (OHS) legislation regulate general duties for employers and controller of premises to identify, assess and control risks to employees and others at a place of work. This includes the provision to identify any foreseeable hazard arising from the premises that has the potential to harm the health or safety of any person accessing, using or egressing from the premises such as people slipping tripping or falling. Additionally there are duties for safety in design, which extends to those who design, specify or supply floor surfaces intended for places of work. The Building Code of Australia (BCA) include safety performance requirements for safe design which requires most commercial buildings to provide slip resistive surfaces for safe movement, specifically emergency access and egress. The slip resistance requirements of Clause D2.10, D2.13 & D2.14 of the BCA state that “non-slip” and “non-skid” surfaces must be installed for pedestrian ramps, stair treads and landings. Further, parts of buildings may need to comply with disability access requirements. Where disability access is required under Section D3 of the BCA, finishes must comply with Clause 12 of AS1428.1 Design for access and mobility Part 1 general requirements for access- Buildings. This states that all continuous accessible paths of travel shall have a slip-resistant surface. AS 1428.1 does not define the term slip resistance. 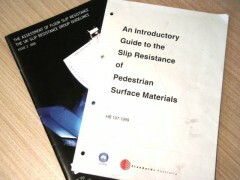 However, the standard refers to AS 4586 and Standards Australia & CSIRO Handbook HB 197 for guidance on slip-resistant surfaces. Standards Australia & CSIRO Handbook HB 197 An Introductory Guide to the Slip Resistance of Pedestrian Surface Materials is seen as best practice for satisfying the slip resistance requirements of new floor surfaces. The handbook provides general commentary on the slip resistance test methods, classification, basis for specification and guidance for designing ramps and sloped areas. Many people may be aware of Tables 3, 4 & 5 of Standards Australia & CSIRO Handbook HB 197 which provides minimum slip resistance classifications for specific locations. There is much more information and detail that must be considered beyond simply extracting the classifications from the tables. Additionally, existing surfaces that do not meet the recommendations of HB 197 may not necessarily be unsafe, a risk assessment and possible control measures should be evaluated by a qualified expert. Annex A through to L of AS 4662 Ceramic tiles – Definitions, classification, characteristics and marking require ceramic tiles of the best commercial quality (first quality) that are intended for use on floors be tested to ISO 10545 Method 17: Determination of coefficient of friction. Currently, ISO 10545 is still to be officially published, however Appendix ZA, Variations for Australian Conditions states to replace ISO 10545-17 with AS/NZS 4586. Thus, floor tiles shall be tested to AS/NZS 4586 to meet the Australian Standards for first quality ceramic tiles. Have you caused loss and amenity to others by negligent action or omission that otherwise would not have occurred if reasonable care was taken?